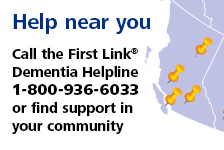 Help break stigma at Alzheimer’s Awareness Month open houses in Prince George, Kelowna, Vancouver and Surrey | Alzheimer Society of B.C. Have an impact on your community at the Climb for Alzheimer’s! Help minds stay in motion at the Climb for Alzheimer's! Help raise critical funds at the Climb for Alzheimer’s! Lead or join an Investors Group Walk for Alzheimer’s organizing committee! Make your coffee count this World Alzheimer’s Day! Thank you for joining us for the Climb for Alzheimer’s – there’s still time for you to donate! On Wednesday, January 9, we welcomed the community into our Victoria Resource Centre for the first of five open houses to mark Alzheimer’s Awareness Month – a chance to meet with campaign spokespeople, Alzheimer Society staff and friends, and to help break the stigma around dementia. The event was a huge success and we’re looking forward to the next four this month, beginning with Prince George on January 17, Kelowna on January 18, Surrey on January 26 and Vancouver on January 31. We invite you to join us and meet your community spokespeople for the powerful awareness campaign entitled: “Yes. I live with dementia. Let me help you understand,” along with our incredible volunteer award recipients. All members of the public are invited, and event details are below. By attending, you will celebrate our successes and show people living with dementia in our communities that they don’t ever walk alone. Events will run from 3 – 5 p.m. at Resource Centres on the following dates. Non-alcoholic beverages and light snacks will be served at all events. Please follow the links below to register for the event nearest to you. Prince George: Thursday, January 17. Click here to RSVP. Kelowna: Friday, January 18. Click here to RSVP. Fraser region (Surrey): Saturday, January 26. Click here to RSVP. Vancouver: Thursday, January 31. Click here to RSVP.